In this post, I’m going to give you the recipe to make a foil pack dinner, Sesame Salmon & Snap Peas. I just recently purchased Hungry Girl To The Max! The Ultimate Guilt-Free Cookbook by Lisa Lillien. It has 650 recipes. I really like this cookbook because, first of all, there is a huge variety of recipes to choose from. Secondly, they’re all recipes for people who “crave decadent food without the high-calorie price tag”. Thirdly, they’re easy!! And lastly, she offers Weight Watchers Points Plus Values on every recipe. Can’t get any better than that! I purchased my book from Wegman’s in Frederick. However, you can find it for a better price on Amazon.com. This recipe is in the ‘Foil Pack’ chapter of the cookbook. 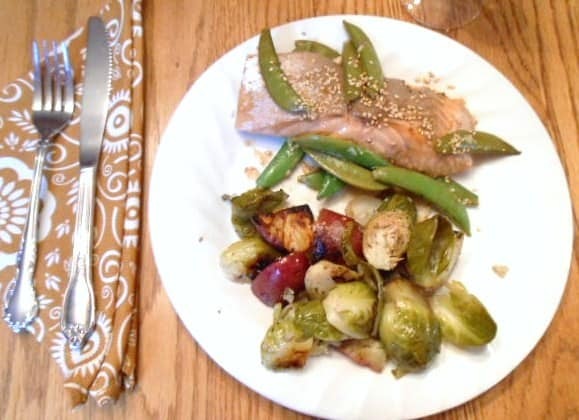 As I mentioned in my 10 Quick & Healthy Dinner Ideas for the Frazzled Sports Mom post, foil dinners are great for when you’re in a hurry but still want a healthy meal to serve your family. 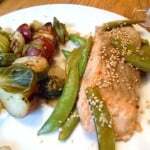 This recipe has a 7 Weight Watchers Points Plus Value. In a wide bowl, mix dressing, garlic, and ginger. Add salmon and flip to coat. 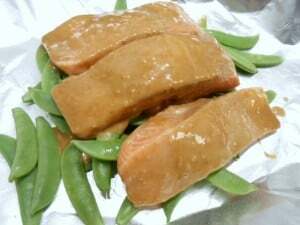 Cover and marinate in the fridge for 15 minutes. Place snap peas onto the center of the foil and top with salmon. 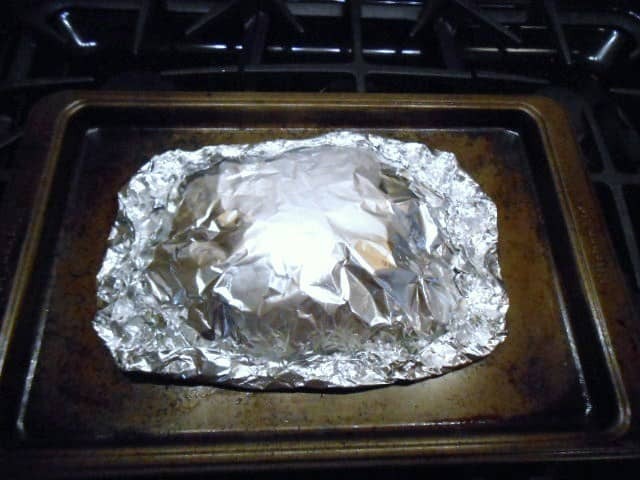 Drizzle with remaining marinade, and cover with another large piece of foil. Bake for 15 minutes, or until salmon is cooked through and snap peas are tender. How easy is this? You just throw it all into the foil and let it cook in its own steam. I didn’t need to spray my heavy-duty foil because I bought the kind that had a non-stick side to the foil. Make note that this recipe only makes one serving. So adjust accordingly. I tripled it so that it would make enough for my husband, my son, and me. This will also increase the cooking time. I ended up cooking the 3 salmon fillets for approximately 30 minutes. You have no idea how good this was! It was so flavorful and all of the salmon’s natural juices were sealed in. My son at first would not eat it. We told him he had to eat at least one bite. After that, he finished it without any more prompting. The sugar snap peas were still crisp, which I liked because they had a crunch to them. 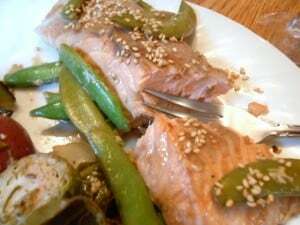 And I loved the addition of the sesame seeds after taking it out of the oven. 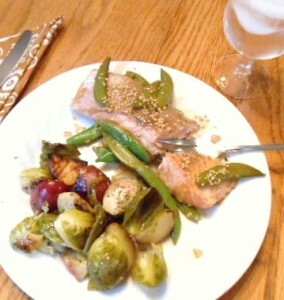 I served the salmon with another one of Hungry Girl’s recipes from the same cookbook, Hustle ‘N Brussels Pack Attack. Stay tuned for a post with this recipe too. It’s another foil recipe and soooooo gooooood! I also found some naan bread, which is an Asian oven-baked flatbread, at Wegman’s in Frederick and served that with the dinner. 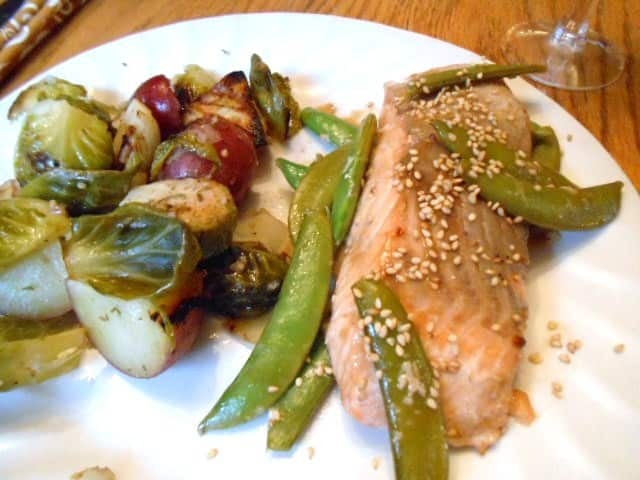 I seriously felt like I was at a restaurant eating our yummy, healthy, and EASY dinner! I am officially on the foil pack dinner bandwagon and will be searching out more foil pack recipes in the near future.